I am writing a blog entry about a movie which features life of food blogger. This movie is based on a book "Julie and Julia" by Julia Powell. So Julia Child writes Book "Mastering art of French Cooking" published in 1961. Julie Powell write Blog based on the book. Blog becomes successful and she writes a Book "Julie & Julia". Julie & Julia Book becomes successful and Nora Ephron makes a movie. Movie gets a Golden Globe Award for Best Actress category ( Actress: Meryl Streep ). Julie Powell and Julia Child are separated with two generations but lead same life when it comes to their passion for cooking and support. Both the women get much support from their husbands, although at one point Powell’s husband is fed up with her excessive devotion to her hobby and leaves her briefly for a few days. Movie takes you through a great comedy drama, now a days you hardly find in Hollywood movies. Most of the English movies soon jump into scientific fiction, gadgets, action, unusual scary creatures. You will enjoy movie scenes which are taken back and forth, where Julie life moments are linked with Julia’s life. For example while Julia goes to sleep in bed in the past story Julie wakes up from the bed in current story. Mastering the Art of French Cooking is a two-volume French cookbook written by American Julia Child, Simone Beck, and Louisette Bertholle, both of France. The book was written for the American market and published by Knopf in 1961 (Volume 1) and 1970 (Volume 2). 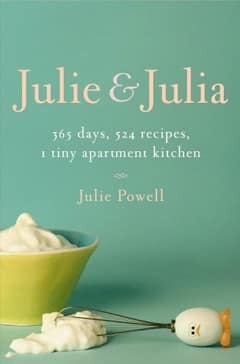 Julie Powell (born 20 April 1973) is an American author known for the book Julie & Julia: 365 Days, 524 Recipes, 1 Tiny Apartment Kitchen. Amy Lou Adams (born August 20, 1974) is an American actress. Adams began her performing career on stage in dinner theaters before making her screen debut in the 1999 black comedy film Drop Dead Gorgeous. Recently Julie & Julia is awarded Golden Globe award.